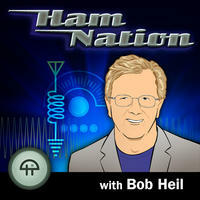 As a big fan of ham radio and an avid listener of the TWiT network, I’m pleased as punch that Leo Laporte has asked Bob Heil (K9EID) to host a show called Ham Nation. I spoke with Bob about the new show at the 2011 Dayton Hamvention. He has many ideas and a lot of enthusiasm and energy to put into Ham Nation. His first line up? None other than Joe Walsh WB6ACU and Dave Jennings WJ6W. Bob also has plans to use future shows to give Leo Laporte radio lessons so he can obtain his Tech License.This could be a first for ham radio and leveraging the listenership of the TWiT network, could bring a lot of newcomers into the hobby. Click here to go to Ham Nation’s home page. Subscribe to Ham Nation via iTunes. This entry was posted in Announcements, News, Websites and tagged Bob Heil, Dave Jennings, Ham Nation, Joe Walsh, K9EID, TWiT Network, WB6ACU, WJ6W. Bookmark the permalink.